Turtles have inhabited the planet for nearly 230 million years and can be found everywhere except the Arctic and the Antarctic. Turtles are also long-lived with some turtles living more than 200 years. Children enjoy learning about turtles and this can be accomplished through reading activities, aquarium visits, games and crafts. A turtle sock puppet is an easy craft for children to make and will provide little ones with hours of imaginative play. Put the sock on your hand. 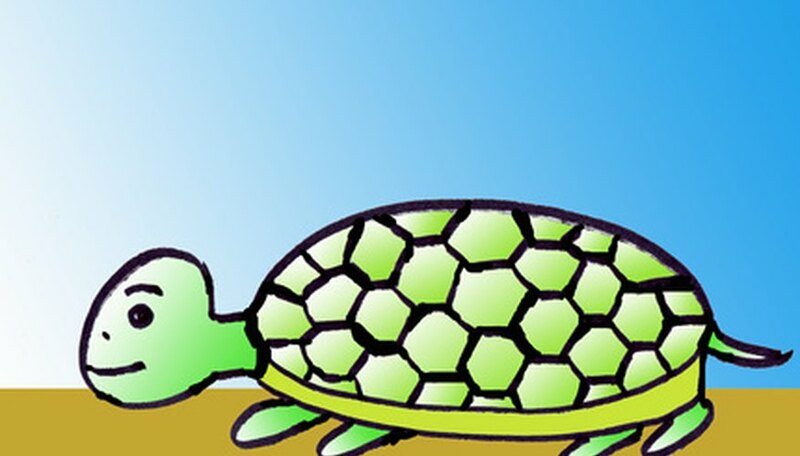 Place your fingers into the toe of the sock and your thumb into the heel to create the turtle's mouth. Cut a small semi-circle out of the pink or red felt for the tongue and use the glue gun to affix it to the inside of the mouth. Use the glue gun to glue two googly eyes to the sock directly above your finger joints. Cut two oval shapes out of the remaining felt. Use markers or fabric paint to draw a turtle shell pattern on each felt oval. One oval should resemble the top of the turtle shell, the other should resemble the bottom. Glue the felt turtle shells to the sock puppet. Place the top of the shell over the top of your hand and place the bottom of the shell under the palm of your hand. Cut four turtle legs out of felt and glue them to the sock in the space between the top of the shell and the bottom of the shell. Allow glue to dry completely before playing with the sock puppet turtle. Children should be supervised when using a hot glue gun to avoid burns. Cheryl Stephenson-Hearns works as a public servant in St. John's, Newfoundland and Labor, writing articles for several newsletters. She has also been writing children's books since 2005. Stephenson-Hearns holds a Bachelor of Arts in French language and literature from Memorial University of Newfoundland.